Belleville's first park, Bellevue Park, is 27 beautiful acres on the city's central west end near Memorial Hospital. The park offers a tranquil, 3-acre fishing lake and gentle rolling terrain that also serves as a picturesque site for small outdoor weddings. A historic stone lodge, built in the W.P.A. days, is the home of Camp Quackers summer day camp program. The stone lodge is available for rental at various times of the year for family or company functions. It is a perfect setting for bridal or baby showers. The lodge is heated/cooled and equipped with a small kitchen facility and restrooms. It also has six 6 foot tables and 40 chairs for seating. For fitness fanatics there is a double tennis court and a one mile fitness trail that meanders throughout the park. Playgrounds and picnic activities are also available for the young at heart. There's music in the air during the summer evening concert series at the park's Music and Drama Facility. Come on out to West Park Drive and join the toe-tapping good times at this long time Belleville tradition. 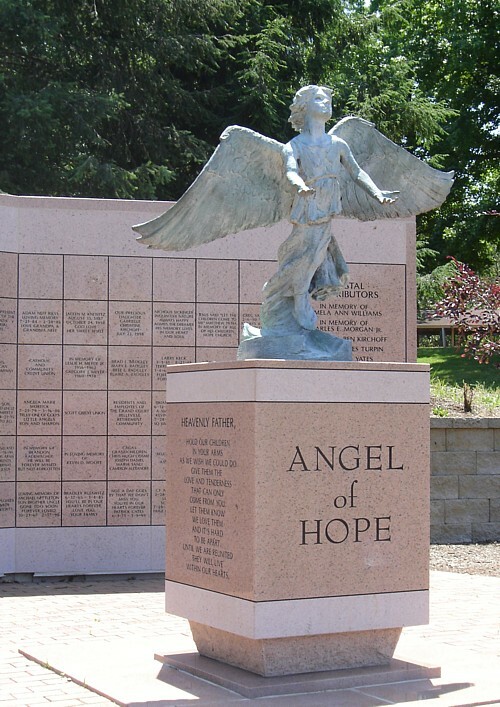 The Belleville Angel of Hope Statue is located in a quiet setting in Bellevue Park. It stands as a symbol of hope for all parents and loved ones that have experienced the death of a child, no matter what age. Honor your children's memories with different level sponsorship. The annual Angel of Hope Candlelight Vigil Ceremony is held every year on December 6, at 7 p.m. The ceremony will begin with a brief program at the Stone Lodge in Bellevue Park followed by a candlelight procession to the statue. Parents, loved ones, and visitors are encouraged to bring flowers to leave at the Angel. All bereaved parents, grandparents, relatives and friends are welcome.